From show-stopping spreads to fragrant roasted meats, Torontonians can get their Italian food fix at The Fresh Italian Eatery. Let Marco serve you excellent sandwiches with superb service. These creations are made with authentic Italian spread and toppings – which Nonna would approve of! The Rea is comprised of 4 cured meats (genoa salami, capitol, hot soppressata, and mortadella) and is served with giardiniera, lettuce and diced tomato. The red-sauce spot is located in the Village by The Grange. It’s the perfect stop for OCAD University students or those visiting the Royal Ontario Museum nearby. It’s also worth seeking out if you’re craving delicious Italian food. If you’re a starving artista, the eatery has great specials. 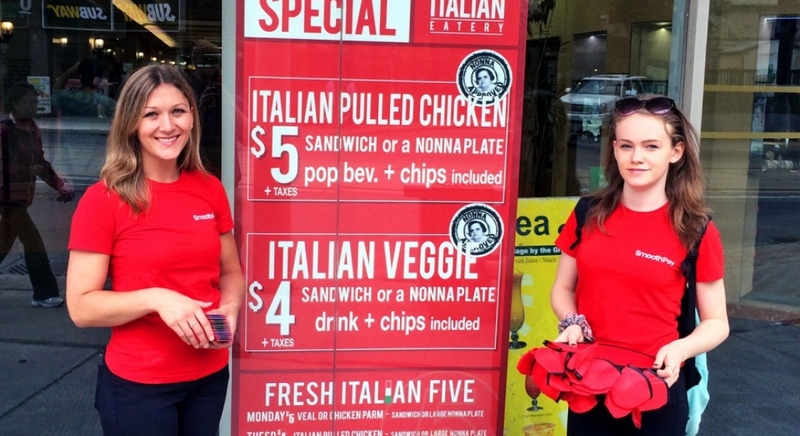 Our favourite is the Italian Pulled Chicken – served either as a sandwich or a nonna plate – with pop and chips for $5. Look out for daily promotion (like $4 Chicken Parm) Monday through Friday! The Fresh Italian Eatery offers loyalty rewards and mobile payments with SmoothPay. Use our app to get rewarded $3 when you spend $40. You also get $1 off your first purchase.